Who buys V6 F-bodies? I have no idea, and that's probably a good thing. I'll do my best to speculate though: 30 year old secretaries looking for a "sporty" car shaped like a gym shoe, and high school kids looking for....a sporty car shaped like a gym shoe. Scott, not wanting to align himself with a bunch of idiots, spent a few years working on this little beastie. I guess technically, there isn't much that sets it apart from your run-of-the-mill LT1 F-body. But, the point is that it looks like a V6 car, and that it required brainpower and effort to put together. Check out the V6 wheels! If you're fooled by the sound of the Scott's car, well, you might want to stop hanging out with your Geo Metro racer buddies for a while. But other than that, there aren't any warning signs. 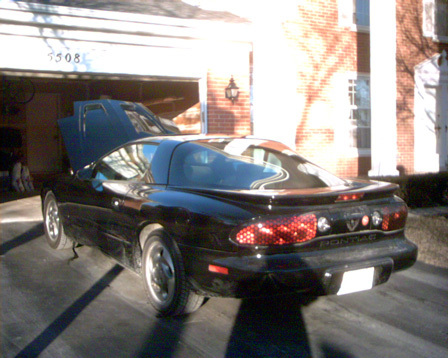 Scott didn't just throw the LT1 in - he added an LT1 Hot Cam and some other bolt-ons. 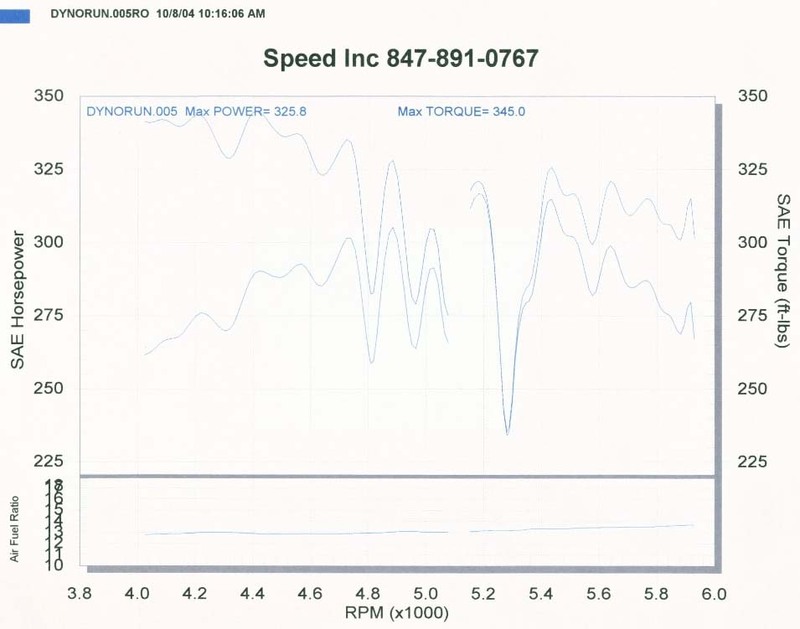 With only 3.73 gears, it's running harder than your average Camaro with a best of 12.08 @ 114 on stickeys. Better air and better launching should put a high-11 on the scoreboard! For more info on Scott's car, check out Scott's site, v6conversion.com. I will scan the latest run as soon as I have a chance. Scott took the car back to LS1 Inc (www.ls1speed.com) where he had a long-standing credit for a dyno tune. A few hours later Jim had tuned the car and while the torque curve was not perfect (owing to some minor ignition glitch elsewhere), it was ten-thousand times smoother than before. The car felt great and runs like a charm now. Jim tuned the car with a stock MAF he had laying around and told Scott to ditch the Granatelli and go back to the stock MAF. Once that was completed and a leaking trans line was secured we went to Byron Dragway and made some runs. Scott's best run of the day was a 12.08 @ 114 with a 1.80 60' time! Talk about the perfect combo by accident! With some better air we'll see high 11's. Stay tuned! E-mail him and tell him to stop playing World of Warcraft and update his damn site. More tuning at Speed Inc results in more problems. After talking to Jim (dyno tuner and owner of "INTMD8", a 9sec TT street driven camaro), we figured the problem is either in the wiring harness, which has had to be modified in places to fix non working wiring links, or the computer. Scott managed to get his hands on 2 new computers, a wiring harness, and a Grantelli MAF. We'll put it all together if Scott ever calls me, then take the car back to Speed Inc for the final tune. Stay tuned for timeslips and pictures of future 7.5" 10-bolt carnage!